Currently the Karoo is poorly surveyed for biodiversity and there are large gaps in our understanding of which species occur in which parts of the Karoo. This hampers efforts to determine priority habitats that may be sensitive to future proposed changes in landuse. The Karoo is seen as an important development area for South Africa, and there needs to be responsible decision-making around developments such as shale gas exploration, farming, mining, renewable energy infrasctucture and the Square Kilometre Array. 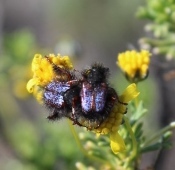 SANBI has led a consortium of institutions to a successful funding grant from the Foundational Biodiversity Information Programme (FBIP), a joint initiative of the Department of Science of Technology (DST), the National Research Foundation (NRF) and SANBI, so that we can advance our scientific understanding of valuable Karoo ecosystems and contribte to informed decision-making. 2) conducting detailed surveys for 14 representative taxonomic groups (plants, mammals, fish, birds, amphibians and reptiles, as well as six invertebrate groups: bees, dragonflies, grasshoppers, scorpions, butterflies and spiders, and fungi and nematodes) in areas targeted for shale gas exploration. The Agricultural Research Council’s Plant Protection Research Institute (ARC PPRI) – both fieldwork and collections relating to bees, spiders, nematodes and fungi. The American Museum of Natural History – for scorpion fieldwork, species identification and overseeing digitisation of 8000 scorpion specimens. The Lepidopterists’ Society of Southern Africa (‘LepSoc’) – fieldwork and identifications of species for butterflies. The South African Environmental Observation Network (SAEON) – fieldwork and monitoring of permanent plots. The South African Institute for Aquatic Biodiversity (SAIAB) – fieldwork and threat assessments for fish species. BirdLife South Africa – fieldwork and threat assessments for bird species. Stellenbosch University – fieldwork and threat assessments for dragonflies and grasshoppers. Collections institutions that will be involved in digitisation and surveys: Albany Museum, Port Elizabeth Museum at Bayworld, Bews Herbarium (University of KwaZulu-Natal), Bolus Herbarium (University of Cape Town), Compton Herbarium (SANBI), Ditsong Museum, Iziko Museum, and National Museum. Universities that will be involved in surveys and co-supervising postgraduate research: KwaZulu-Natal, Cape Town, Stellenbosch, and Pretoria. DNA barcoding work will be a joint effort between SANBI, the National Zoological Gardens and the University of Johannesburg. Species threat assessment work will be supported by the NGOs the Botanical Society of South Africa, the Endangered Wildlife Trust and the International Union for Conservation of Nature (IUCN). End-users supporting government decision-making are the Council for Scientific and Industrial Research’s Environmental Management Services, DEA’s Strategic Development Support Directorate, SANBI’s Policy Advice section, provincial environmental authorities (Eastern Cape, Northern Cape and Western Cape) and local municipalities. By the end of the project approximately 200 000 new primary occurrence records will inform species occupancy and habitat richness models which, along with approximately 300 Red List assessments of species of conservation concern, will be served to decision makers via the SANBI’s Land Use Decision Support (LUDS) tool. – Help us transcribe the data from museum and herbaria collections using the online Transcribe platform. There are thousands of historical museum and herbaria specimens collected before the time of computers! The information in these specimen records is critical to understand previous distribution patterns of species, but the information is inaccessible if it remains in hard copy only. Photographs of the specimen have been uploaded onto Transcribe, but we need your help to type the data from the specimen label into the database. By doing this transcribing, you are helping to make species information as old as 1830 available to scientists and the general public! – feel free to post observations of Karoo species on iNaturalist using the Karoo BioGaps Project when you are out in the Karoo. 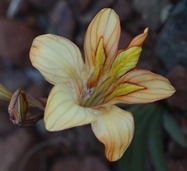 Any record of any species in the Karoo is useful to us, particularly those in the 12 taxonomic groups. By posting your picture of a species with its location information onto iNaturalist, you will be adding to the knowledge about the distribution range of that species. Species experts will have access to your image on the website, and will identify it for you. You might spot something really unique! For more information about the project, please contact project manager Dr Theresa Sethusa.